MALAYSIA Airports Holdings Bhd (MAHB) and Mitsui Fudosan Co Ltd will build the first upscale Japan factory outlet in Southeast Asia at the Kuala Lumpur International Airport in Sepang. To be known as Mitsui Outlet Park KLIA, it will be built on a 20.25ha site, complete with F&B and entertainment facilities as its complementary components are based on strong themed attractions such as Knowledge and Attractions, Prime Time Complex and World Food Expo. The park, the first Mitsui Outlet Park in Southeast Asia and 14th for Mitsui, will be developed over three phases at an estimated gross development cost of about RM335 million. It will boast a total lettable area of about 47,000 square meters upon full completion, thus positioning the outlet park as the largest within Mitsui's stable of outlet parks. The first phase of development is expected to begin within the first quarter of next year and is expected to open its doors to the public by end of 2014. "The outlet park will offer a wide selection of leading brands including luxury brands, popular select shops, high grade and top Asian fashion, sports and outdoor items, fashion accessories and gifts at prices that are guaranteed to be below their recommended retail prices," MAHB said yesterday. More than 240 famous international designer brands will be invited based on their presence in existing Mitsui Outlet Parks in Japan and China. It will also offer top Asian fashion from Japan, South Korea, Hong Kong and Malaysia, thus setting it apart from the other retail centres in Malaysia in terms of breadth of brand diversity, it added. Mitsui, a leading real estate developer in Japan, has been established since 1941 with global operations in the US, UK, Singapore and China. It is mainly engaged in the development of shopping centres, hotels and office complexes. The two companies signed a memorandum of understanding on the project yetserday. 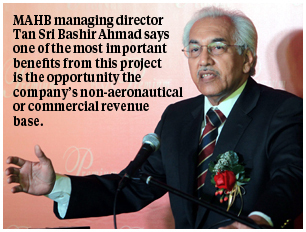 "One of the most important benefits from this project is the opportunity to further expand our non-aeronautical or commercial revenue base, in line with our '2010-2014 Business Direction: Runway to Success'," MAHB managing director Tan Sri Bashir Ahmad said. PETALING JAYA: I-Bhd posted a turnaround in net profits in the third quarter ended Sept 30 of RM3.95mil from a net loss of RM1.28mil a year earlier. In its filing with Bursa Malaysia, the developer of iconic i-City said the vast improvement in profit was due to mainly a higher profit recognition from the property development division. Revenue for the quarter was 204% higher at RM16.32mil against RM5.36mil previously. The increase in revenue was on profit recognition from on-going projects from the property development division as well as contribution from the new theme park under the leisure division. To reward its shareholders, I-Bhd is distributing a special share dividend of one treasury share for every 14 shares held. The entitlement for the dividends will be on Dec 12. Lim added that i-City had now evolved into a RM5bil urban cyber centre township, which has been designed as an “international business hub by day” and “lifestyle haven by night”, with residential, commercial and leisure components. Moving forward, he said profitability would continue to grow with income streams from the property and leisure divisions. Earlier in May, the group launched high-rise condominiums i-Residence, which has a gross development value (GDV) of RM232mil. All the 173 units available in the west wing of the development have been sold out. An equally promising take-up rate was shown by the higher-end units the east wing as well as the 20 villas which opened for sale in August, Lim added. All 220 small office versatile office units with a GDV of RM64mil have been fully booked at the launch in August. The company expects to launch the first phase of the 12-acre small office home office development, which consists of 956 units with a GDV of RM317mil in December. The entire projects will be launched in three phases from 2012 to 2014.